READ IT HERE • WEB ONLY STORY by Will Mueller Tap beer, refinished floors and a new paint job are just a few of the summer improvements the Bremen Café’s new owner David Copp has planned for the Riverwest establishment. Copp purchased the Bremen Café (931 E. Clarke St.) this January along with his father. He plans to renovate the bar during Summerfest, implementing a new painting and lighting scheme, refinishing floors and the bar, adding tap beers to the current menu and improving outdoor seating. “I chose Summerfest because I think it is the best time, or possibly the only time, where I might have a lack of customers until winter break,” said Copp. He has already purchased new outdoor furniture. In addition to physical improvements to the bar, Copp plans to offer daily drink specials. He says his “comedy open mic” on Monday nights is gaining popularity. Copp will be continuing Thursday’s “musical open mic night” and is planning on trying out a “poetry open mic” in the near future. Copp also wants to add a Yobo gaming system which would allow patrons to play Nintendo and Super Nintendo games on nights that do not feature bands or open mics. In addition to the video games, Copp hopes to have a wall of board games free for customer use. “We already have a group of ‘Magic: The Gathering’ players who come in regularly,” said Copp. 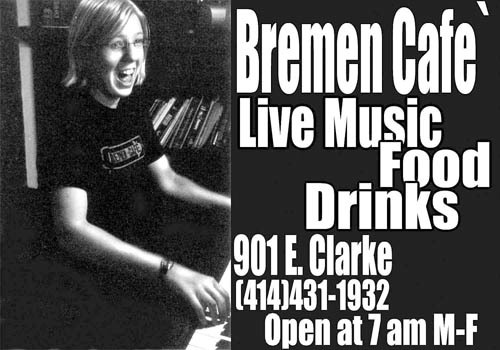 In addition to being a bar and entertainment venue, the Bremen Cafe also has a menu featuring sandwiches and pitas and sells fair trade coffee from Milwaukee-based Boom Bros Coffee.